This corded necklace is made using waxed cording. The length can vary from about 16 to 19 inches with a center jeweled piece that adds 2 inches. It is done in white and kelly green. The jeweled piece starts is a beautiful blown glass piece with green and white swirls. 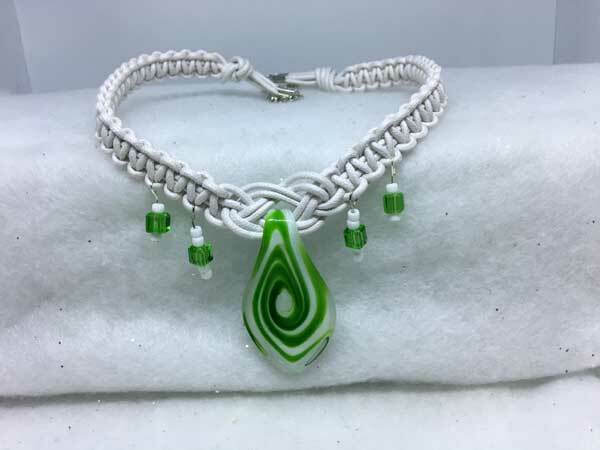 I have added some fun dangles on either side using kelly green glass cubes and white seed beads. The piece is finished with a lobster claw clasp and added chain for more versatility with the length.